6 br, 4 ba plus game room and loft, sleeps up to 16! Have a large family? A LOT of friends? Both? This is the house for you! Located mid-way up Tahoe Donner, with a two-car garage and mostly flat driveway, this home has room to tuck in everyone! Choices abound. Entering from the garage you can either head straight into the house and go up or down stairs, or you can stop into the laundry room to drop off your wet clothes first. Or, from the covered front door space you're in the tiled mudroom full of coat hooks. If you're in the mood to just lounge around, take a quick left into the carpeted sunken family room, complete with wood burning stove, flat screen TV & DVD and lots of couches. From the entry way, head to the kitchen and second living space. This area also has a wood burning stove, dramatic high ceilings, and access to the back deck with forest views. The kitchen is large and open, easy for entertaining! All black appliances (including an oven and separate 4-burner cook top on the island) take a back seat to the retro green tile counters and endless storage. One breakfast bar (yes, there's two!) straddles the space between the living area and kitchen, while the other shares with the dining room. The kitchen's double sink has a deep window overlooking the trees and under counter lighting throughout provides both ambience and utilitarian purposes, while the pendant lights and recessed lighting give you lots of brightness options. The dining room with huge table and room for 8 or more is set off just enough to provide privacy for a family meal. Heading off the kitchen, you'll find a full laundry room with washer/dryer and lots of storage and shelving and also a full bathroom is just off the area. There's even a bedroom w/ a futon tucked into the main level, and a half bathroom just off the second living room. Downstairs is where the party really gets started. You'll see a genuine recreation room: a pool table with a ping pong topper, flat screen TV/DVD and sound system; and bistro style table for four and a mini table for the kids-all set in a huge hang out space. Those devoted to late night games will enjoy either of the sleeping spaces. One dedicated bedroom offers a full size futon, the other isn't listed as a bedroom because it has some electrical equipment in it; however it is furnished with a queen bed (not listed in the bedroom count). The third floor holds the rest of the home's bedrooms. First you'll enter a spacious loft-style space with a high ceiling and skylights. There's a full shared bathroom with a deep tub/shower combo. One bedroom has a twin/double bunk bed plus another double bed. Another bedroom has a queen size bed and both have walk-in closets. The master bedroom has high ceilings with clerestory windows for natural lighting and a huge space for both a king-sized bed and double bunk beds. It's private bathroom is equally breathtaking with more high windows, double sinks, linen closet, shower stall and a jetted bathtub with room for two. This home offers plenty of space for privacy and hanging out with the group. Perfect for 2-3 families of several couples. The Tahoe Donner community offers several communal amenities to vacation renters including a year round pool, spas, fitness center and classes, snow play area, cross country skiing and more for a nominal fee. 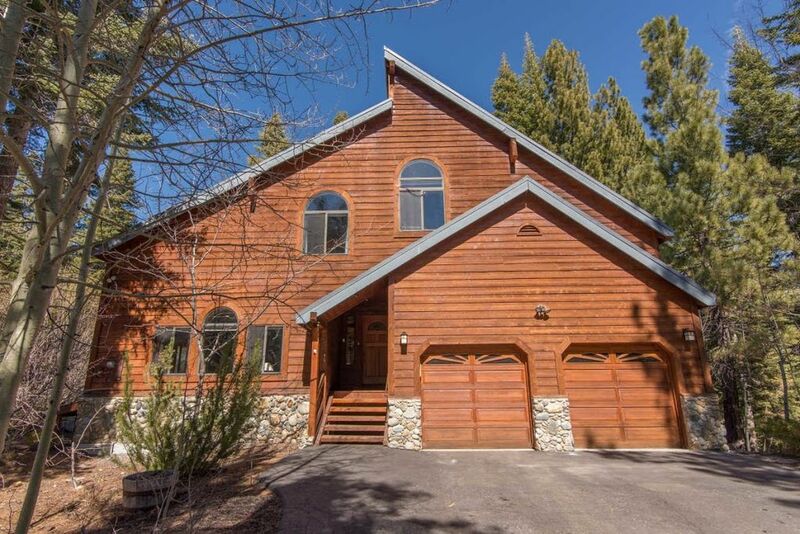 Enjoy the best Tahoe Donner has to offer with this spacious and family friendly rental-we look forward to welcoming you to Casa Grande de St.Bernard! Tahoe Mt. Properties specializes in nightly rentals and ski leases in the North Tahoe, Truckee and surrounding resorts areas. We offer a proactive, smart and friendly approach to property management. When you stay at a TMP property, expect to arrive with the lights turned on and the heat turned up prior to your arrival. Extended office hours are offered, with an easy cell phone contact for after hours emergencies. We look forward to hosting you on your next Tahoe getaway! Large house with a flat driveway (useful when snowy/icy). Loved the downstairs room with pool/ping pong table/TV for the kids to hang out in while adults enjoyed the comfortable upstairs. Would definitely stay again. Amazing place for an amazing price. All amenities to make it feel like home at a reasonable price. Only negative was the clothes dryer was inoperative which we did not find out about unti washing a load of laundry. Sorry you had a problem with the dryer, it works, it just makes a loud noise sometimes. We stayed at this house from Dec. 26-29, 2018 This was a family vacation. The location was easy to get to, and close to the Snowplay at Tahoe Donner. Fun for the grandkids ages 10 years to 20 months. The house was clean, and had everything we needed. It was great to have pellets and wood provided for the two stoves. Holly was wonderful to work with. Ton's of room and easy to get to. We had a huge crew (18) and there was plenty of space for all of us. Having the rec room was great for the kids. There were a couple of issues with the tub & shower, but Holly had someone there in no time. We had a group of 18- 6 kids/ teens. 6 families total and we had plenty of room. The game room was a hit with the teens. Holly from the property company was very responsive when we inquired about late check out. Lots of linens and towels for everyone. Very Spacious home for a big group with plenty of beds; However it could use some updating. This home is very spacious with 3 comfortable beds, the other 3 beds are pretty small and not that comfortable. For the price they charge, this house should definitely have air conditioning as the temperature reaches the mid 90's. The outdoor space needs comfortable/newer outdoor furniture. The furniture provided is old, mismatched , and falling apart. We also swept the outdoor deck and removed spider webs which was a little upsetting due to the high cleaning fee. The outdoor lighting does not work and although we contacted the property managers, it wasn't properly fixed. The doorlocks for the restrooms located on the main floor do not lock. Other than that, the location of the home is in a desired location as its close to the lake and recreation center. Tahoe Donner is located 10 minutes to downtown Truckee and Donner Lake and 20 minutes to all major ski resorts including Northstar, Squaw, Alpine Meadows and Sugar Bowl.